Let me tell you, I fail miserably at banana bread. Burnt on the bottom, raw in the middle, deflated..I am not kidding! If there was a way to ruin it, I would. I have been on a mission to find the right combination of ingredients to yield a moist flavorful banana bread that cooks evenly throughout. After a lot of trial and error…. 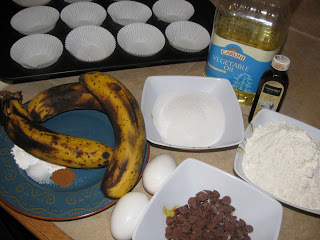 I got to mixing and……..Houston, we got ourselves a winner;) I am really excited to share this simple yet delicious recipe for chocolate chip banana muffins. Let’s get baking! measured out flour and add them to the chocolate chips. Why?The flour coats the chocolate chips and keeps them from sinking to the bottom of the batter. Peel your 3 ripe bananas and with a fork mash them down well. 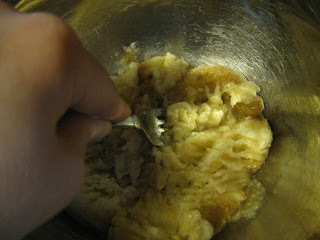 Add the oil and the eggs to the mashed bananas and give it a quick whisk. Next, add the vanilla extract and sugar and whisk well to combine. Add in the baking powder, baking soda, salt and cinnamon and give it another whisk. Whisk in the flour. Lastly gently fold in the chocolate chips. recipe that has ever worked out like that for me! YAY! check at about the 15 minute mark to see if they are cooked through. the muffin comes out clean with no crumbs or batter stuck to it. Preheat oven to 400 degrees and line your cupcake pan with the liners. 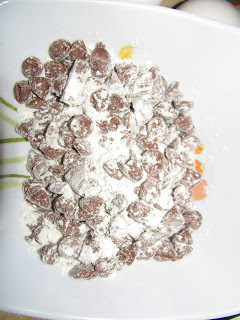 Add 2-3 heaping Tablespoons of your measured flour into the chocolate chips and mix well to coat the chips. Peel bananas and mash well with a fork. 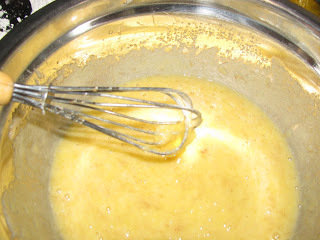 Add oil and eggs to the banana mixture and whisk together. Next, add vanilla extract and sugar and whisk to combine. Add the baking powder, baking soda, salt and cinnamon: whisk well. Add the all purpose flour and whisk well. Fold in the chocolate chips. With a 1/4 C measuring cup start filling the liners with your batter (Remember, using a 1/4 C measuring cup will give you exactly 12 muffins). 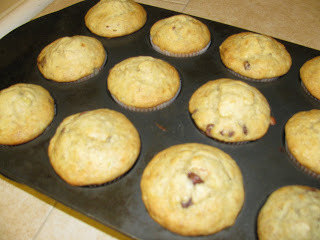 Bake in a 400 degree oven for 16-18 minutes or until a toothpick inserted in the center of the muffin comes out clean. Cool 15-20 minutes and enjoy! These muffins turned out moist and flavorful just as I had hoped. The balance of flavors is perfect. As always you can personalize this recipe to reflect the likes of you and your family. 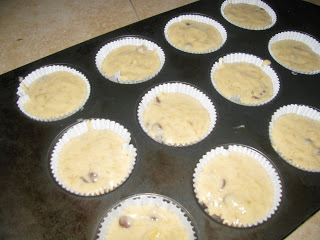 The muffins would also be delicious with some chopped walnuts mixed in the batter. I hope you enjoyed this recipe as much as my family did! Thanks for taking the time to stop by!